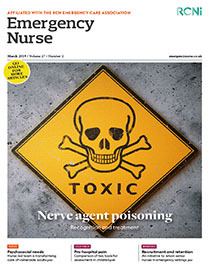 Victims of violence often seek assistance from emergency departments, so emergency nurses are ideally placed to identify them, and other ‘forensic’ patients, and protect the evidence that could support any ensuing legal process. Emergency nurses who are trained to identify, collect and preserve forensic evidence can support the identification, elimination and prosecution of suspects. This article gives an overview of forensic evidence, and explains how emergency nurses can preserve and collect samples effectively.